This is a text that has been originally published in the group Les mamans Duchenne. On June 18th in 2009, it’s been almost ten years ago today that the DMD diagnosis for Félix fell on us. I say dropped on us, but it was more or so as if I got shot in my chest. Duchenne muscular dystrophy…pow! Incurable…pow! Loss of walking ability, decreasing life expectancy, wheelchair…Pow! Pow! Pow! This incurable disease will slowly take my little boy away without letting me do anything to stop it. I went shopping with Félix right away after the diagnosis because that’s what we planned to do: going for dinner at a restaurant and buying him sneakers. I can remember sitting at a table, Félix couldn’t stop talking (as usual). I look at him, and I smile. He’s six years old. I just want to scream and cry. ” Hi, Daniel! How are you?” The mother speaks with interveners. Between two words, she gives pieces of a cookie to her son, because he can’t raise his arms to his mouth. She keeps going as she still speaks, she puts the juice with a drinking straw close to his mouth. Let me say I absolutely do not understand how they’re doing to be happy talking here, and even laughing! I find them impressive, and his mom fascinates me, I don’t know how she does it. Today, I know. I know that you do learn to live with the disease. It becomes a part of our life. One day, I wake up, and resilience shows up. I got to prepare myself to deal with the disease because the diagnosis is a shock that we must go through, but other shocks will follow. I must decide to fight, to roll up my sleeves and move ahead to make sure Félix lack nothing and help him the best I can so he can also go through shocks and help him grieve. This text has been published on a private group called “Les Mamans Duchenne” that is administered by Carole Auclair. Only one woman in 50 million is affected by Duchenne muscular dystrophy (DMD). Considered as a male disease, DMD usually affects boys (1 in 3500). Some people don’t know that they exist. Those women affected by DMD are there, and they are suffering from this lack of education. Know that DMD is a rare disease and difficult to live for a boy. So, just imagine what it could mean for girls. 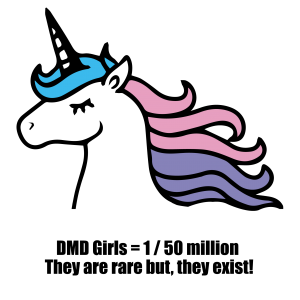 They face many additional obstacles; they aren’t unicorns they exist, and DMD girls deserve to be heard. Here’s what Feriel had to say and without censorship. Feriel is a young woman of 26 years old, native of France. Tiredness related to DMD didn’t stop her to become a world traveller. She visits many countries going through Europe, Tunisia, Mauritania, Cuba and Senegal to only name them. She is also a cinephile and loves everything that involves culture. Simply put, she loves life. She fights to live life to the fullest every single moment. It is in 1998 that she received the diagnosis of Duchenne’s myopathy (myopathy is the term used in France). She was only six years old, and it was already challenging to hear this news. However, repeating continually that she has a male disease amplifies her pain. Feriel Cheba: ” It’s very hard as a parent to learn that your child has this disease especially when doctors tell you constantly that it’s a male disease. Incomprehension and unfairness are high. Why do so many doctors think this disease doesn’t affect women? It is time now to tell talk about it with young medical students, it has to be told during their genetic courses that Duchenne’s myopathy affects mostly boys and sometimes girls too”. She also gets many hurtful comments. There is a lack of resources and answers. In fact, it is even harder for girls to access clinical trials. Two neurologists told her that some clinical trials were open for boys exclusively, what she thinks is an injustice. Feriel Cheba: “People do not believe me. They tell me that it’s impossible that I am affected by this disease. People don’t like what is rare. An internist even told me that it was an anomaly. Am I unnormal? No, I don’t think so. I am only different as everyone else”. Despite all the difficulties encountered, she remains hopeful. She takes advantage of every moment spent with her family and friends. She also knows the existence of a treatment that can help with her specific mutation. Although, she can’t access it since its exclusive for walking patients. In her heart, she keeps hoping and dreaming of the day there will be a treatment for everyone suffering from DMD. Portrait of Duchenne – For the love of his brother! What’s it like to live with DMD? As a parent, to face the reality that your child has a fatal disease? As a person with DMD, to face an inevitable, premature death in your twenties? As a sibling, relative or friend, to face mourning your loss? The journey is beyond words. Our Web short documentary series, “Portrait of Duchenne Canada”, will present the experiences of families and children with DMD. You will meet five Canadian families who are taking on the challenges of raising money and leading the way in advocating for access to new treatments. Today, more than ever, it’s time to share their stories. New treatments are on the horizon and families need to be heard to advocate for ways to access them quickly. Samuel Fleurant-Beauchemin’s brother Guillaume had DMD. Guillaume was gradually losing the use of his arms. One day, Samuel came to visit his brother with a sparkle in his eyes. He had just seen a JACO robotic arm. He believed that the wheelchair-mounted device would restore Guillaume’s independence. Samuel decided to get his brother the robotic arm at all costs! He would start a non-profit organization to raise funds. He would quickly succeed in his task. And he did. But on the day that the arm was installed, destiny struck. Guillaume was admitted to the hospital, where he passed away shortly afterwards. Despite this ordeal, Samuel decided to continue to give back. Today, he runs an organization called A bridge to autonomy. To date, they have given 20 robotic arms to children with DMD in Quebec. Bruce Babington, our own La Force athlete, will cycle across Canada in July 2018 to raise funds and awareness for DMD. Our part is to tell their story. We invite you to share this story with your community. 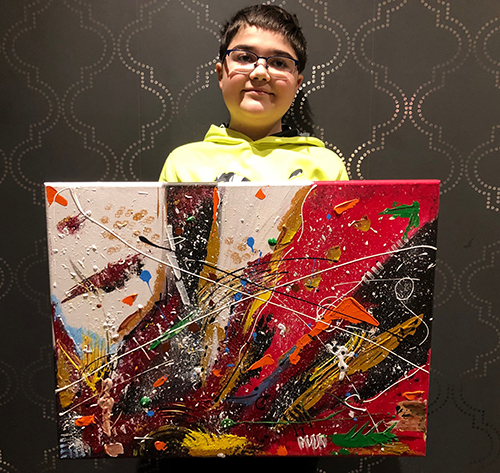 https://laforcedmd.com/wp-content/uploads/2018/05/portrait-of-duchenne-for-the-love-of-his-brother.jpg 356 815 Marie-Catherine Du Berger https://laforcedmd.com/wp-content/uploads/2016/08/logo-laforce.png Marie-Catherine Du Berger2018-05-18 11:18:062018-05-23 14:45:47Portrait of Duchenne - For the love of his brother! Portrait of Duchenne – Victor’s unforgettable experience! It took about two years of going back and forward to doctor appointments before the Morand family got a DMD diagnosis. Like every other parent, Jean-Philippe Morand turned to the Internet looking for answers. He understood… the best hope for Victor was research. Exactly one year after receiving the diagnosis, they started a fundraiser event called Dystrospin. They’ve raised thousands of dollars for the past four years, but Jean-Philippe wanted to do more so he started running and cycling with Victor which made them on top for raising funds awareness for DMD. In 2017, the father and son travelled over 600 km; they ran two marathons (Québec and Ottawa) and accomplished a track cycling of 650 km called La randonnée Jimmy Pelletier. This is the inspiring story of Jean-Philippe and Victor. Duchenne muscular dystrophy (DMD) is a rare disease with no cure. Orphan drugs that target its causes are being developed now. But we need your help. Research is the only hope. And research needs funding. https://laforcedmd.com/wp-content/uploads/2018/05/portrait-of-duchenne-victors-unforgettable-experience.jpg 356 815 Marie-Catherine Du Berger https://laforcedmd.com/wp-content/uploads/2016/08/logo-laforce.png Marie-Catherine Du Berger2018-05-11 09:04:522018-05-18 11:14:05Portrait of Duchenne – Victor’s unforgettable experience! Portrait of Duchenne – Every action counts! When Max Sedmihradsky was two-years-old, he received the DMD diagnosis. The news was devastating beyond words for his parents Kerry and Andrew. After a moment of profound sadness, Andrew came up with the idea for Max’s Big Ride. Every year he cycles between Ottawa and Hamilton, Ontario, with Max in front of the cargo bike. The ride aims to raise funds and awareness for Duchenne muscular dystrophy. Andrew works at the University of Toronto, where the researcher Patrick Gunning also works. Andrew took the chance to reach up to him to see if he would do some research for DMD. At that time, Patrick Gunning reached out to his graduate students to start a research on DMD. They found out that the cell they are working on, “Stat 3”, plays a decisive role in DMD. A year later, after this chance encounter, the Gunning Group received a $300,000 grant and are performing ground-breaking research for DMD. This is the story of Max’s Big Ride and the Gunning Group. Duchenne muscular dystrophy (DMD) is a rare disease with no cure. Orphan drugs that target its causes are being developed now. We need your help. Research is the only hope. And research needs funding. Sharing these stories is one step forward towards the cure. https://laforcedmd.com/wp-content/uploads/2018/05/chance-encounter-launched-groundbreaking-dmd-research.jpg 356 815 Marie-Catherine Du Berger https://laforcedmd.com/wp-content/uploads/2016/08/logo-laforce.png Marie-Catherine Du Berger2018-05-04 11:31:532018-05-18 11:16:00Portrait of Duchenne - Every action counts! This is the story of John Davidson going the distance for his son Jesse and ends up raising millions for new research. In 1986, the Davidson family learned their son Jesse had Duchenne muscular dystrophy (DMD). They had never heard the expression before. The diagnosis literally flipped their world upside down. They knew little about science and research, but they figured quickly it was their only hope. When Jesse got to an age where his mother, Sherene, had to do the lifting because he was losing mobility, John switched from golfing to walking to stay in shape so he could spend more time with his family. His walks were getting longer and longer, so an idea came to him. Maybe he could walk across Ontario with Jesse, shake some hands, raise funds and get people talking about DMD. He did! The walk across Ontario was so successful that he decided soon after that to walk across Canada solo. The sum of these two challenges leads to the rise an organization called “Jesse’s Journey.” In the course of the past twenty years, John Davidson and Jesse’s Journey have raised over 9 million dollars. Duchenne muscular dystrophy (DMD) is a rare disease with no cure. Orphan drugs that target its causes are being developed now. But we need your help. Research is the only hope. And research needs funding. For the past 20 years, Canadian families, like the Davidson, have been raising funds for research and awareness of DMD. Their actions and successes have funded current research. Now that new treatments are emerging, families need to unite and be heard to access new treatments quickly. What’s it like to live with DMD? As a parent, to face the reality that your child has a fatal disease? As a person with DMD, to face an inevitable, premature death? As a sibling, relative or friend, to face mourning your loss? Through our series, the DMD community and people beyond our community will feel this very painful experience. We meet five Canadian families who are taking on the challenges of raising money and leading the way for access to new treatments. Today, more than ever, it’s time to share their stories. New treatments are on the horizon, and families need to be heard to advocate for ways to access them quickly. What’s it like to live with DMD? As a parent, to face the reality that your child has a fatal disease? As a person with DMD, to face an inevitable, premature death in your twenties? As a sibling, relative or friend, to face mourning your loss? Our Web short documentary series, “Portrait of Duchenne Canada,” will present the experiences of families and children with DMD. You will meet five Canadian families who are taking on the challenges of raising money and leading the way in advocating for access to new treatments. Today, more than ever, it’s time to share their stories. New treatments are on the horizon, and families need to be heard to advocate for ways to access them quickly. This is the story about Bruce Babington, who will cycle across Canada in July 2018 to raise funds and awareness for DMD. Bruce has made a radical decision to cycle solo across Canada in July 2018. His goal is to help people afflicted with Duchenne muscular dystrophy (DMD). Bruce is an osteopath. About one year ago, he started to treat Anakin Lacasse, a 9-year-old boy with DMD. It was the first time that Bruce had encountered a patient with this condition. Anakin was rapidly losing muscle strength, and Bruce quickly became aware of his patient’s reality. Then, he learned about Anakin’s mother’s involvement in La Fondation La Force. Bruce was so moved that he made up his mind, just like that, to do something to help. So, in July 2018, he’s taking one month off work to cycle an average of 200 km/day between Mont-Tremblant, QC, and Vancouver, BC, in 24 days. How will cycling across Canada help the DMD community? We are running a fundraising campaign: “Bruce Across Canada.” La Fondation La Force will award all “Bruce across Canada” funds to the most promising Canadian research. We want to give a voice to the Canadian DMD community. Bruce’s endurance challenge is about starting a conversation on access to new treatments in Canada. Two new treatments for DMD are approved elsewhere in the world. Many other treatments are in the final phase of clinical trials. Canada has no framework to review new therapies for rare diseases quickly and efficiently, and the reimbursement process for such treatments is incredibly cumbersome. Add your voice to our conversation. Be a change maker. Help us to ensure that a whole generation of children and young adults with DMD can access new treatments. It’s time to rise to the challenge! Our part is to tell their story. Sharing these stories is one step forward towards the cure. Donate to “Bruce across Canada” Donate here. Donate to our organization, so we can continue to help the DMD community to get closer to treatment. Donate here. In this inspiring interview of our series “Portrait of Duchenne,” La Fondation La Force talks with Émilie Meeus, Oscar’s mother, raising funds for research into Duchenne muscular dystrophy (DMD). Émilie’s life changed when her three-year-old son Oscar was diagnosed with DMD. She decided to do something to make a difference including by starting an association to help the research. We interviewed Émilie in 2016 at Action Duchenne conference in London. Émilie and her family live in Brussels, Belgium. Before they received the diagnosis, the family had at first to wait for the results, hoping the muscular dystrophy wouldn’t be Duchenne’s. They carried hopes and expectations based on earlier negative tests which were given by doctors. Émilie’s family was perhaps about to learn a shattering news which would drastically change the direction of their life. Once they have accepted the situation and they have been supported by professional doctors, some other things interacted and helped them move on and progress. Émilie Meeus and her family wanted to create an association to raise funds and support Duchenne muscular dystrophy’s research: “We’re going to try to help the research and treat the disease. And, even if we fail it, we’re going to give him the best possible life.” So, besides allowing them to stay well-informed about the disease and its latest developments and so for the progress of the research, they’ve been able to expand their social circles, talk with other people suffering from the same disease and listen to their experiences. Their approach allowed them to stay positive and hold on the hope of living a happy life. Until Oscar is old enough to understand his medical situation, he’s for now able to figure it out through images and simplification with the help of his family. The progression of DMD is unforgiving: the body’s muscles gradually weaken, leaving children with DMD in a wheelchair by age 12. They have a life expectancy of 20 to 30 years. There is no cure and, in Canada, no treatment for the cause. Two treatments for DMD are approved in the USA and Europe, but they don’t benefit all children with DMD. Promising treatments, in development, are expected within 5 to 10 years. We thank Action Duchenne, who received us with open arms to conduct a series of interviews. To receive the next interview in our series “Portrait of Duchenne,” please subscribe to our newsletter.